We take your privacy very seriously here at My Turriff. As you will no doubt be aware from the sheer size of your mailboxes, everyone is trying to make sure that they have covered everything off for the new General Date Privacy Regulations that came in to force on Friday. We are no different, we had a sizable email list to which we would send a digest of the days news and posts on My Turriff to. Last week we said that we would be deleting the old list and creating a new one so that we were sure we were fully compliant with the shiny new GDPR thing. So in the spirit of openness and transparency I thought that I should update you as to what I have done with the old list. Being green and environmentally friendly, I thought that recycling the list was best for the environment so with security in mind I took it to the skip in Macduff and put it in the paper recycling. Why Macduff? Well this was the cunning part of my security plan, I thought that the email addresses wouldn’t be any use to anyone as far away as Macduff and I have it on good authority that no Nigerian scammers have been seen in the area in the past two weeks. So there you go, you can sleep soundly knowing that your E-mail address has safely been destroyed, probably. Seriously though, the old list for the My Turriff newsletter has been deactivated and will be deleted. 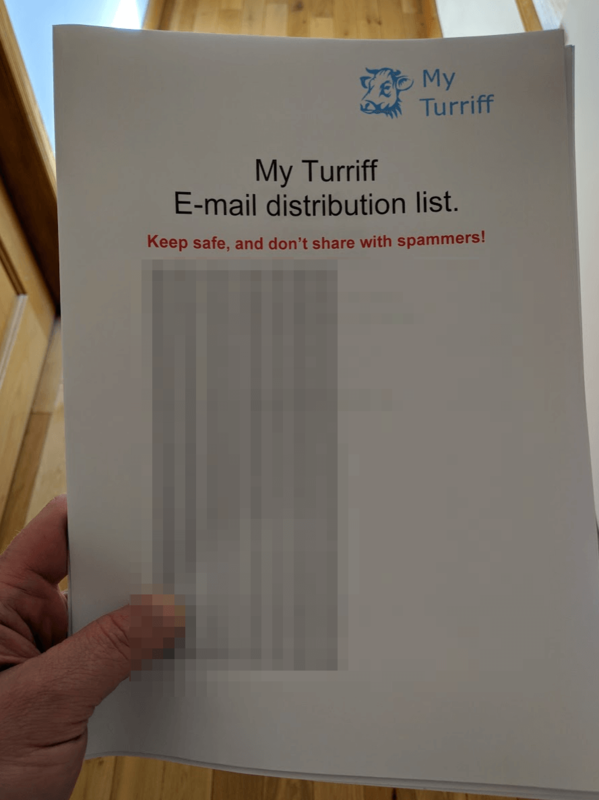 If you want to continue getting E-mail updates from My Turriff, fill in the form below, prove you are human, click the link in the E-mail that you get sent and hey-presto you will be on the new list.